Or the cause of a juvenile and adolescent idiopathic scoliosis. The position of a joint is determined by the shape of the joint and/or the muscles that exercise forces on it (the spinal column is a series of stacked up joints). Studies on the shape of the vertebrae have shown that these are not abnormal in shape in early scoliosis. However, a study by Kouwenhouven et al. (Analysis of Pre-existent Vertebral Rotation in the Normal Spine 2006 en The Role of Intrinsic Spinal Mechanisms in the Pathogenesis of Adolescent Idiopathic Scoliosis 2007) demonstrated that, e.g. at midthoracic level, a rotation of the spinal column towards the right occurs both in the scoliotic and in the nonscoliotic vertebral column, probably to protect the heart and/or the aorta. This explains why the curvature usually occurs towards the right at that level: the tendency already exists. If it does not depend on the shape of the vertebrae, the curvatures must therefore be the result of muscular contractions. According to orthopaedic science, a human being does not require correction for differences in pelvic height of up to 2 cm; he can correct that by himself. However, many years of experience have taught me that the cause of most complaints of the locomotor apparatus (from head tot toe) can be found in asymmetry of the pelvis. In my practice I discovered that the body may not only efficiently correct a difference in pelvic height, but also that muscles become overconditioned, as a result of which overcorrection occurs. As a result, the crista iliaca posterior is higher and the spina iliaca anterior superior (SIAS) lower (in 98% of cases). Anteversion of the pelvis occurs, which can also lead to verticalisation of the coccyx. In order to see whether someone does that, one must sit behind the person, with the fingers on the posterior pelvic rim. Require a straddle, with the pelvis in the middle. A lowering of the corrected pelvic half indicates a positive test. Either that side was lower or at the same level and becomes even lower, or (which occurs more frequently) it was higher and then becomes lower. This effect occurs because in a straddle, correction by the leg muscles is entirely undone and that by the back muscles is largely undone. This test is also often positive in individuals with a functional scoliosis. So how does the scoliosis develop? With the leg muscles the body corrects the pelvic height difference, by pulling the inner side of the lower leg laterally through contraction of the m. Flexor hallucis longis and the m. tibialis anterior (in 99% of cases) with a counter reaction of the mm. peroneus longus et brevis. In the upper leg it is especially the m. sartorius which pulls the leg laterally, with a counter reaction of the tractus iliotibialis and the m. biceps femoris longis. In the worst case one could thus create an abduction contracture (Dr. P. Van Loon observed that the m. biceps femoris is shortened on the affected side). Consequently the leg becomes longer. The other leg (including the foot) can move a little medially and possibly bend the knee a little, as a consequence of which that leg becomes a little shorter. In the lower back the m. iliopsoas can lift the leg with its insertion on the trochanter minor. (The Cesar-Mensendieck remedial therapy regional group Alkmaar discovered that the hip joint on the affected side has some constrictions; given the operation of the m. Iliopsoas and the upper leg muscles this is understandable.) In various photographs of my pilot study the os pubis is higher on the right than on the left, possibly because the head of the hip joint lifts the entire pelvis on that side. The m. lattisimus dorsi (one of the largest muscles in the body) runs from the posterior pelvic rim, along the vertebral column, over the inferior scapular angles, to the upper side of the upper arm. Through fixation of the muscles of the shoulder, neck and arm, this muscle can lift the pelvic rim posteriorly, with the SIAS going down. In many cases one observes the right arm swinging less during walking. The body can develop a scoliosis in various ways. I will discuss the two most important ones. m. lattisimus dorsi pulls up the posterior pelvic rim and – at midthoracic level – pulls the vertebrae to the (convex) right. During periods of growth these muscles remain short; they become shorter relative to the other muscles and pull the back in ever greater curvatures. Since the vertebrae and the intervertebral discs could dislocate and thereby cause damage to the nervous system, the body allows the surrounding tissues to harden in order to limit the damage. The following table gives data of my pilot study as well as of clients with a clear idiopathic scoliosis who did not participate in the study. 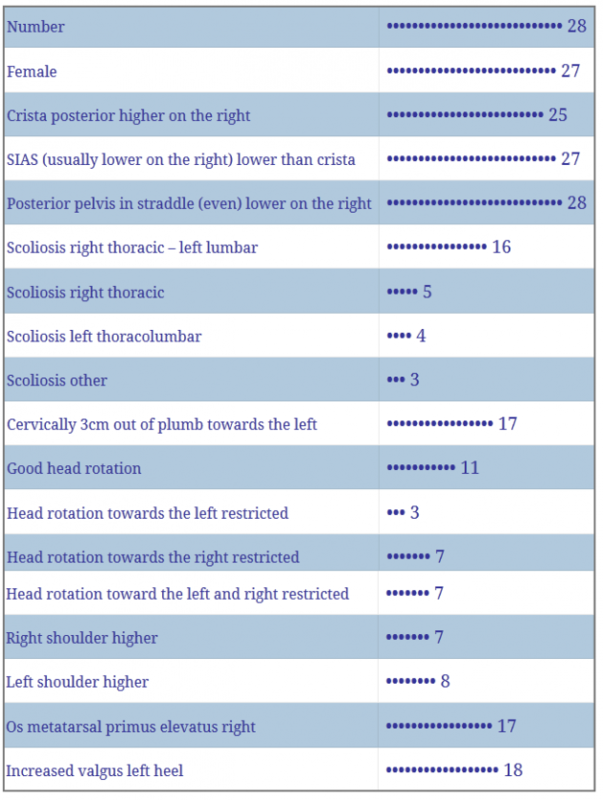 Although the table gives the impression that only a pelvis that is lower on the right can cause a scoliosis, I must point out that it can also involve an overcorrected pelvic slant to the detriment of the left. However, the rotation of the mid-thoracic vertebral column towards the right remains dominant. Approximately 2-3% of children develop a scoliosis, of which six times as many girls as boys. Thus one can say that this phenomenon occurs in 5% of girls in lesser or greater degree, of which 10% with serious defects. In puberty girls do not walk with their chest stuck out, and even pull the upper back a little too round. Boys during that period need be tough, and they do walk with their chest stuck out and the shoulders a little raised. When boys tighten the shoulder and neck muscles on both sides rather than on one side, this might well cause Scheuermann’s disease – an affliction that develops at the same age as scoliosis. Mathematically it fits: approximately 3% of children develop Scheuermann’s disease, of which boys six times as often as girls. This is equal to the percentage that has a serious scoliosis. The school test – bending over to assess whether there is a gibbus – is not the right way to detect scoliosis. The scoliosis is then already present and consolidated – as opposed to the scoliosis that is only functional. If my hypothesis is correct, the propensity for scoliosis can be detected differently and at an earlier stage, and with a simple solution consolidation of the scoliosis can be prevented. Test the children with the straddle test. If positive, especially on the right side, administer a shoe heel lift made to measure and tested, for as long as the child is growing (especially if there is a positive family history for scoliosis, Scheuermann’s disease or Bechterew’s disease). Thus the body is encouraged to refrain from muscular correction. A large scientific study could demonstrate this, but for that I lack the means, time and ability. © No part of this page may be used without the author’s permission.